This article passes by the unfathomable honours of Cristiano Ronaldo to focus on his most human side. Frequently unknown for those who criticize him. We’re sure that your opinion of Cristiano will change after reading this. Cristiano Messias Ronaldo dos Santos Aveiro was born in the Estate of Falcão (Quinta do Falcão in Portuguese), one of the most poorest district of Funchal, capital of the Portuguese island of Madeira, on 5th February 1985. His family was deeply humble. His father, José Diniz Aveiro, was a municipal gardener and because of being an admirer of Ronald Reagan (actor and former president of the United States) he calls his son Ronado. His mother worked in a restaurant as a cook. 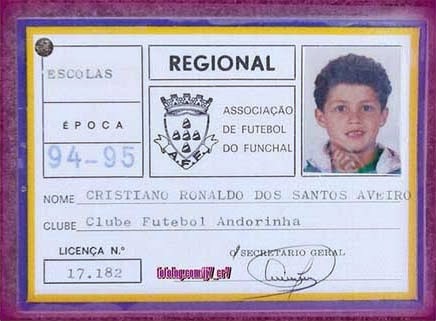 At 9 years old, Cristiano took his first steps playing in Football Club Andorinha, where his teammates made fun of him because his father, to win an extra pay, cleaned the locker room’s latrines. They gave him nicknames as “the crybaby”, because he did so when they didn’t pass the ball or he didn’t score a goal. Other of his nicknames was “little bee”, because he didn’t stop running tireless all around the field. Despite of everything, Cristiano Ronaldo says that his childhood was happy. Why? “Because he never separated from the ball, he slept with it” says his mother. He signed for one of the island’s bigest teams, the Clube Desportivo Nacional. One day an offer arrived for the Nacional’s president: if he sold Cristiano to Sporting Club of Portugal, the club’s huge debt would be settled. 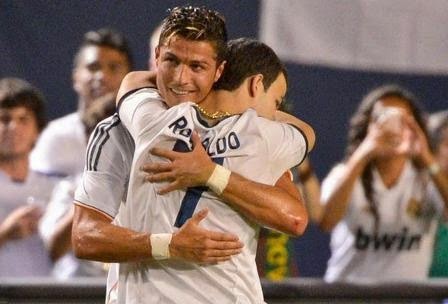 Finally, Cristiano left to Lisboa and the Nacional overcame the failure thanks to the sale of Ronaldo. In the Sporting he trained in the gym until all hours of the night, finishing a lot of later than his teammates. He exercised throwing free kicks no matter what the weather was. Besides he worked as a ball boy for the Sporting to send his family money. He earned 5 euros for each match. His biography tells that his teachers came to ridicule him in public cause his island accent, but the worst was when he had 14 years old and his father became an alcoholic and his brother Hugo fell into the drugs. It was a very hard period for Cristiano. He was completely alone in Lisboa and his family was going through a tough time. As if that were not bad enough, at 15 years old, doctors found him a heart problem. If he didn’t operate soon, his life would be in danger and he wouldn’t play football again. After get his father’s permission, he went through a dangerous operation and, to everyone’s surprise, within a few days he was asking to play again, and that’s what he did. Thanks to the financial aids of Cristiano, his family get back on their feet. In Sporting’s youth team, they payed Cristiano the equivalent of 50 euros per month. In Sporting’s first division, his salary was raised to 2,000 euros per month. In Manchester he earned 150,000 euros per month, and actually in Real Madrid earn 1.1 millions euros according to World Soccer. When Ronaldo signed for Manchester, he was the image of the famous video game EA Sports, FIFA 2004. However, his trainer Alex Ferguson forbade him to play it, which he did to protect him cause he thought the player was too young. At 20 years old Cristiano Ronaldo got the news that his father had died due to alcoholism. No family member told him, Luiz Felipe Scolari, then coach trainer of Portuguese national team, was the one who told him. Even so, he showed again his professionalism and played the match with Portugal national team. In the same year a woman accused him of sexually abusing her in a room of Sanderson hotel in London. He was absolved and some time later it was demonstrated that she had done it to get his money. Cristiano is a great example of self-improvement for the youth. He doesn’t drink, smoke and, of course, take drugs. He helped his brother Hugo to rehabilitate of drug addiction and thanks to this nowadays he manage a paint factory with 15 workers. For his mother he bought a wonderful mansion in the island and helped her sister Katia to reach her dream of being a pop singer. He hired for her the producer of Lady Gaga. Katia use Ronalda as her stage name. The oldest of the Ronaldo’s sisters, Elma, also lives thanks to a shop called CR7 in a district of Funchal. CR7 hugs a child who jumped into the field. Cristiano has been very generous all his life, not only with his family, but with everybody. During the 2004 Indian Ocean tsunami, he saw a guy with his T-shirt and traveled to the affected areas, he met the country’s president to raise founds and he donated 120,000 euros. In 2011, after the bombing of Israel in Gaza Strip, he auctioned his Ballon d’Or to help build schools for Palestinian children. He promised orphan children that he will let the world know what happened and in 2013 he refused to exchange his T-shirt after an exhibition game with Israel. He has promised not to get a tattoo ever because he couldn’t donate blood during some months, which he does twice a year since he was a teenager. A few years ago Carlos Martins, Granada’s player, asked for help for his son who was suffering from leukemia. Due to the indifference of almost all of League’s players, Cristiano became bone marrow donor and since then has invited sick children to the Ballon d’Or award ceremony. In Madeira he has built a museum to keep all his awards. Tourist packages to travel to the places when he spent his childhood have been made and thanks to it he has employed many of his compatriots. His countrymen are very grateful to him because the publicity that Cristiano made of his native island is priceless. He has helped to make know his favorite meal, grilled cod, Portuguese typical dish made with potatoes and eggs. His favorite drink is santal made with fruits of Madeira region. Many people criticize Cristiano for his disproportionate ambition. An ambition that, in fact, has saved lives, including among others his own brother and dozens of children all over the world. Many people say he is uncultured, but the truth is that he can speak Portuguese, English and Spanish perfectly, something which our politicians don’t know, for example. It is often forgotten that Ronaldo didn’t have the opportunity to study and also didn’t have a father figure to support him. At only 23 years old Cristiano Ronaldo won his first Ballon d’Or. Many other players get discouraged after achieve a great success so young, but years after, he keep on training to an inhuman level, achieving another two more Ballon d’Or. Portugal government has recognised the sacrifice of Cristiano Ronaldo and had granted him the tittle of Grand Officier of the Order of Infante Dom Henrique for helping to spread Portuguese culture, history and values. Cristiano is a great guy and a lot of people should know his story.